Product information "Haibike SDURO Fullseven 4.0 gray/black/green men 2019"
The SDURO Fullseven is equipped with 27.5 inch wheels. These guarantee manoeuvrable and agile handling in the terrain and on trails. The 120 mm suspension fork and the 180mm disc brakes provide the necessary security. The damper increases the traction on root passages and thus simplifies the ride in difficult terrain. The exit is much more relaxed and the driving pleasure increases enormously! With the 20 gear shift you always have the right gear for every terrain. So you're not too steep! This is also ensured by the powerful Yamaha PW-SE with 250 W. The 500Wh battery ensures that you can handle long trips without any problems. Thus, the SDURO Fullseven is the perfect choice for longer off-road tours! Tire Schwalbe Nobby Nic Performance, 60-584, 27.5 "x 2.35"
Especially with eMTBs, attachments or rockfalls that can seriously damage the deep-seated engine are part of everyday life. For this reason, we were the first manufacturer in the world to introduce the SkidPlate in 2012, a protective element that effectively protects the engine from below. The concept of a so-called "victim component" is pursued: similar to a helmet, it degrades by deformation or destruction those impact forces that would otherwise damage the much more expensive engine. For this reason, we also use a special, impact-resistant plastic. This can on the one hand good forces derive and remains on the other hand, even with great deformation dimensionally stable. Because unlike metal, which would bend permanently, plastic returns to its original state. The production in the paint color perfectly conceals scratches and damage. If necessary, the SkidPlate can be exchanged easily and inexpensively. The Yamaha PW-SE engine is just as powerful and reliable as its predecessor. In addition, it also scores with improved support at a cadence up to 110 rpm and Bluetooth connectivity. Thanks to his Zero Cadence support, he supports the driver right from the first turn of the crank. As one of the few middle engines, it also allows a double chainring, which offers a larger transmission bandwidth and thus an even better uphill and downhill behavior. Its high maximum torque of up to 70 Nm, its compact size and low noise level make it one of the best drives for sporty eBikes. 1.7 "LCD display for a wide range of applications with easy-to-use and large display of speed and battery capacity. The power supply of the side switch is ensured by the battery of the drive unit on the wheel. Delivery only within Germany (except Islands)! 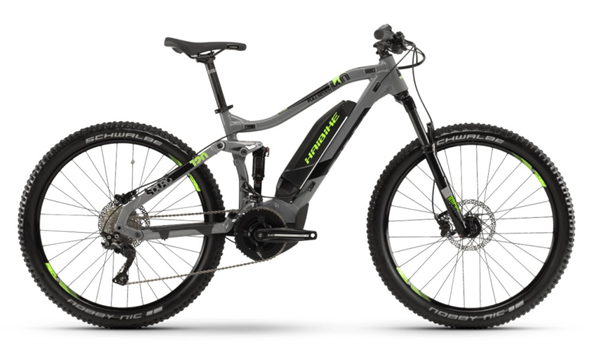 Related links to "Haibike SDURO Fullseven 4.0 gray/black/green men 2019"
Customer evaluation for "Haibike SDURO Fullseven 4.0 gray/black/green men 2019"